What happens when the Poet Laureate, Carol Ann Duffy, fancies a break from writing poems and instead pens a funny children’s story? Oh – and what if she teams up with illustrator Lydia Monks, famous for What the Ladybird Heard? You’ve probably guessed the result: this gorgeous book! Queen Munch lives in a palace shaped like a wedding cake. She likes a jolly good snack, and her heart is as big as her appetite. Queen Nibble is pale and quiet. She likes making necklaces out of raindrops, and she hardly touches her food. 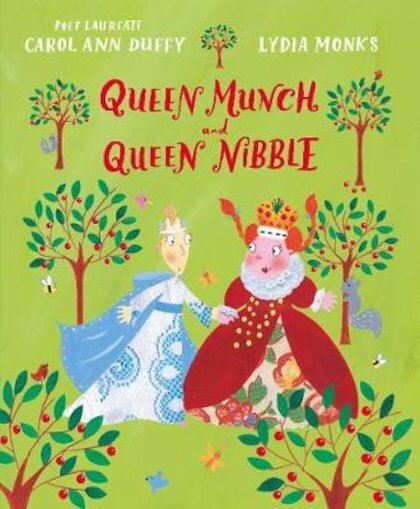 So what will happen when Queen Munch asks Queen Nibble over for tea? Will a friendship blossom?